In a Nutshell: If you’re trying to save money on textbooks, comparison shopping online is the way to go. 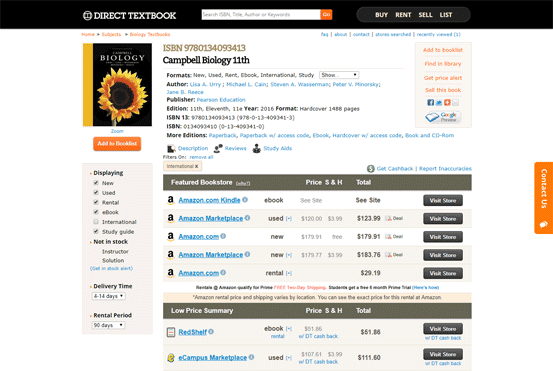 Direct Textbook simplifies the task by aggregating book prices from more than 200 virtual vendors. In the process, the platform helps students find the best deals, discover cheap alternatives, and avoid the steep prices campus bookstores often charge. At the end of the semester, students can log on again and find merchants offering the best buyback prices. Direct Textbook also offers financial tools and resources to help students manage the money they save and earn on textbooks. Ask any college student, and they’ll tell you about the sticker shock they experienced when first shopping for textbooks. Ask the upperclassmen, and they likely know that paying whatever the campus bookstore is charging is not going to be the most competitive price. Many realize the benefits of comparison shopping for books, but may decide the savings isn’t worth the effort if it entails calling multiple stores, creating spreadsheets, and driving an hour to the next town to save $10 on a $300 book. Shopping online can save even more money, but with so many merchants, it takes even more work to ensure you’re getting the best deal. Well, it used to take more work, anyway. Platforms, like Direct Textbook, now do it all for you in just a few minutes. The comprehensive price-comparison platform searches online stores and finds the best deal on individual books. And at the end of the semester, students can also turn to Direct Textbook to find the best prices on buybacks. According to College Board, students will spend about $5,000 on textbooks and supplies over the course of a four-year degree. Direct Textbook is an easy solution for mitigating that expense. “We’ve helped over 35 million students save over $200 million on their textbooks since 2002,” said Brian Morris, Communications Coordinator at Direct Textbook. To get a deal on a book, all you need is the book’s ISBN (International Standard Book Number); Direct Textbook will do the rest. The platform also automatically searches for coupons and informs users of additional savings, often with free shipping. If you’ve got a long reading list or a lot of courses for a semester, Direct Textbook also has a multi-textbook price search tool. Direct Textbook also helps users save by connecting them to other forms and editions of the book they’re seeking. This includes access codes for electronic versions of textbooks, which are traditionally sold in bundles with physical copies. “You can look for stand-alone, valid, working access codes so you don’t have to purchase the full bundle,” Morris said. Users can also find alternative editions such as international versions, instructor editions, and older printings, all of which can provide a wealth of information at a reduced cost. Direct Textbook makes it simple to quickly compare costs on books from numerous online retailers. If buying a book doesn’t fit your needs, the platform also provides rates for renting textbooks. Renting books can be a cost-effective alternative, depending on expected buyback costs. For those who buy, Direct Textbook can help you get the best payout for used volumes. “When the semester is over, we search buyback companies to see what they’re currently offering for your textbooks, and then we show who’s paying the most,” Morris said. Between saving money when buying and finding the best value when selling, Direct Textbook helps mitigate education costs. It’s a top-notch resource for students trying to stick to a budget, which is tough to do in college with little to no income and heaps of schoolwork to juggle. To get the best value through Direct Textbook, students need to understand precisely what they’re shopping for. Unfortunately, sellers and retailers may try to disguise the true nature of a book so they can charge higher prices. For example, publishers often produce school-specific editions of textbooks. This strategy diverts students from cheaper alternatives online, and it funnels them into purchasing brand new, needlessly expensive copies from the bookstore. However, these editions aren’t original books; they’re pre-existing books that are altered and repackaged with different titles and unique ISBN numbers. This hides the fact that the content is fundamentally the same and prevents students from finding cheaper alternatives and reselling the book when they’re done with it. “It can be hard to find someone who will buy it because the ISBN doesn’t exist outside that system,” Morris said. These editions may also include “not for resale” language, which isn’t legally binding, but the bookstore can still refuse to buy it back. This means next semester’s students will also have to purchase costly, new copies. This strategy benefits the store and the publisher, but it can have a serious impact on already-strained student budgets. Morris suggests students in this situation speak with their professors, who are often sympathetic to their plight. Teachers can direct their students to perfectly acceptable and much more reasonably priced alternatives. With this information in hand, students will be equipped to get the best deal. In sum, knowing all the options and taking the time to comparison shop can amount to huge savings for students. Beyond helping students save money, Direct Textbook helps them manage money and navigate college finances. To help students deal with the expenses associated with college life, Direct Textbook provides a pair of free resources: the Student Budget Tool and the Student Debt Destroyer. The latter is a 45-page guide that assists students in managing their income and expenses, set financial and life goals, and work toward graduating debt-free. 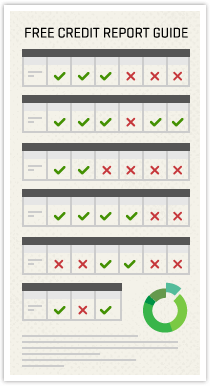 It is meant to be used in tandem with the Student Budget Tool, which is an interactive spreadsheet. A short orientation video (embedded below) walks students through the tool’s function and directs them to the relevant portions of the Debt Destroyer guide so they reap maximum benefit from both. Together, these resources help students manage their money and mitigate their debt by planning for expenses, such as tuition. By carefully managing their money, students can be on the track to debt-free graduation and a solid financial start to their adult lives. “You can anticipate it, save for it, and make sure you have positive cash flow throughout your entire college career,” Morris said. To keep their cash flow positive, Morris recommends students carefully time purchases and sales of textbooks according to demand. The end of each semester, when companies need to restock their inventories, is the best time to sell. The more in-demand a book is, the higher the price students can charge for it. If students wait to sell their books, inventories fill up and offers decrease. When buying books, the best deals are available a week or two after a semester ends. At that point, inventories will be fully stocked, so prices will be more competitive. Waiting for the next semester to start means prices will rise along with student demand. By timing their textbook transactions and searching for cheaper alternatives, students can get the greatest value out of Direct Textbook’s services. Students can maximize their profits on textbook sales, and minimize the cost of new ones by using the service in tandem with the platform’s free financial resources — using college as a stepping stone to a sound financial future.